Academics who study electoral systems largely agree that first past the post (FPTP) is among the least fair voting schemes around for multi-party races. Yet despite its faults—namely its failure to produce a government that reflects what voters ask for—it persists at all three levels of government in Canada. Last Monday, the Wynne government tabled a bill that could change that for municipalities. If passed, cities across Ontario would have the option (but not obligation) to implement ranked ballot voting—a system praised by some electoral reform advocates as the fairer, more democratic option. Here, we break down the ranked ballot system and how it stacks up against other voting models. What is ranked ballot voting? The idea with ranked ballots (also called preferential voting or instant-runoff voting) is to elect a candidate with the broadest level of support. It also avoids strategic voting because vote splitting—where two or more candidates divide the support of a voting group—is unlikely to occur. Under this system, each voter selects multiple candidates and ranks them in order of preference. The first choice votes are counted. If no one party (or individual) has a 50 per cent majority, the last place candidate is eliminated and those who voted for that candidate have their second choice votes counted and tacked onto the first vote count. If, after redistributing, there’s still no one with 50 per cent of the vote, then the new last place candidate is eliminate, and whoever voted for that candidate has their vote for next preferred candidate redistributed. And so on until one candidate has the majority of the vote. How does it compare to first past the post? The very name of our current system suggests a winner-takes-all methodology that disregards how close the opponent may have been to clinching first place. With a first-past-the-post system, whether you’re voting for a city council, provincial, or federal government, you cast one vote which indicates the local representative of your choice. In provincial and federal elections, you vote for one of several leaders nominated in your riding. The person with the most votes—it doesn’t matter by how many—becomes your MPP for provincial elections or MP for federal elections. The party that wins the most ridings wins the election and forms the government. The process is similar for municipal elections, where you vote once for your candidate of choice for councillor in your ward, and once for mayor. There can be well over a dozen candidates running for a particular ward, which means candidates sometimes win with as little as 17 per cent of the vote. In a ranked ballot system, the least popular candidate would get eliminated in that case, and voters’ second choice candidate would be considered, and so on until the elected councillor is backed by at least 50 per cent of constituents. The criticism with FPTP is that the governments it produces don’t necessarily reflect how citizens voted. For example, in the last federal election, the Liberals won 54 per cent of seats in Parliament with less than 40 per cent of Canadians voting for them. And while the Green Party won 3.5 per cent of the popular vote, it represents just 0.3 per cent of Parliament. Ultimately, the system doesn’t represent each voter proportionally, and is considered unfair by some for that reason. 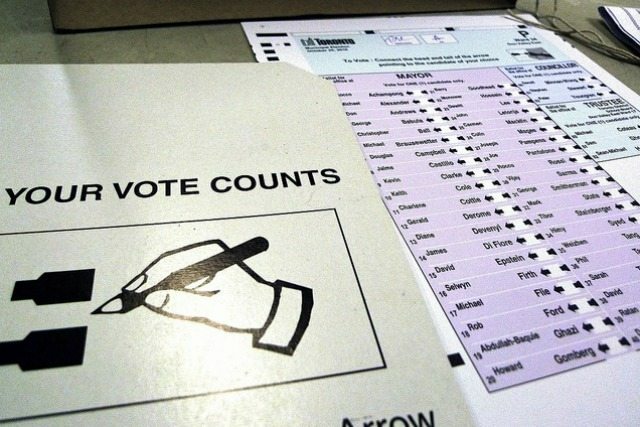 Does ranked ballot voting promote proportional representation? No. Ranked ballot doesn’t eliminate the winner-take-all system: the number of seats a party gets in provincial or federal government still depends on how many ridings they win—not how many votes they get. The reason it’s considered more fair than FPTP, however, is because voters have more say in who will represent them at the local level. For that reason, it’s considered a better tool for municipal elections, where you’re voting for one candidate—not a party. Mixed-member proportional voting—where everyone votes for two candidates (a local representative and a presiding leader) and votes are weighted proportionally—is considered a better model for provincial and federal elections. What about single transferrable voting? This is one form of proportional voting that could be used in Toronto, but implementing it would take a lot more work than introducing ranked ballots. It would involve changing the structure of council by reducing the number of wards from 44 to nine, for example, and having five councillors represent the same ward (or multi-member district). Again, it works by ranking candidates in order of preference, but in this case several candidates will be elected in a riding rather than just one. Like ranked ballots, there’s a minimum number of votes candidates need to be elected. If a candidate gets more than the minimum votes needed he or she is elected, and their surplus votes are transferred to the voters’ second-choice candidate. If no candidate has enough votes after the transfer, the person with the fewest votes is eliminated and the second choices on the eliminated candidate’s ballots are transferred, and so on until all the seats are filled. How has Toronto voted on ranked ballots in the past? City council is a fickle mistress when it comes to ranked ballots. In 2013, council voted in support of ranked ballots, asking the provincial government for permission to implement the system. But when council voted on the potential amendment again this past October, they asked the province not to allow ranked ballots. First term councillor Justin Di Ciano (Ward 5, Etobicoke-Lakeshore) led the fight against the model, arguing it was too complex and would thus deter voters. However, Di Ciano tweeted last week that he was “#workingtogether” with electoral reform advocate Dave Meslin, so at the very least there is some dialogue occurring. Mayor John Tory voted in support of ranked ballots, and has indicated his continued support. Who uses ranked ballot voting? One of the arguments against ranked ballots is that voters would find it too confusing. But it has been adopted by various municipalities and organizations that haven’t seen those fears come to pass. Thirteen American cities use ranked ballots in local elections, and it’s been used in statewide elections in North Carolina. The Academy Awards use the system to avoid naming a Best Picture winner that only 20 per cent of people liked. The NHL and NBA also use ranked ballot voting for their all-star awards. In Canada, federal and Ontario political parties already use runoff voting to determine their party leaders and to nominate their candidates in each riding. But, while Justin Trudeau has hinted at implementing the model for the next federal election, ranked ballots have yet to appear in any local, provincial, or federal election in Canada. CORRECTION: A previous version of this article incorrectly stated that 20 American cities use ranked ballots. In fact, there are only 13. Torontoist regrets the error.